I’m half way through writing a piece on the inhabitants of the wildlife pond which I probably won’t have chance to finish until tomorrow but in the meantime I wanted to post a bit more information about the winter-flowering honeysuckle that the bees (various) have been feeding on this week. 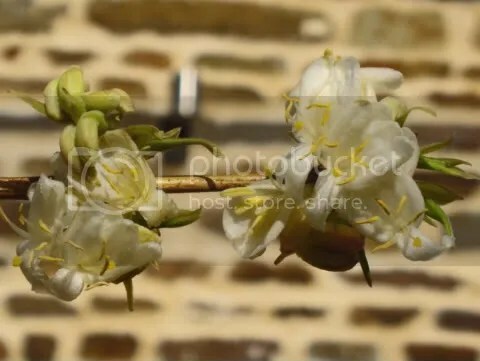 If I’m honest, it’s a pretty dull shrub during the summer so it’s not as if you want it as a feature in the garden but in late winter the bare stems burst into flower and shower the garden with a beautiful sweet scent. A couple of stems in water will scent a room. But, as early food for foraging bees, it is very useful so I’ll take some cuttings this summer and see if I can grow my own. I’ll probably plant successful cuttings round at La Gauterie (our other “department”) which is where the bee hives are and where a line of plain green shrubs won’t matter. Of course, I suppose I could always grow a non-invasive clematis or two through the branches to give it a bit more summer interest. If I vary the varieties, I’ll have flowers from June through to August – early flowerers like Barbara Jackman, Gurnsey Cream, Nelly Moser and Mrs Cholmondeley followed by later flowering clematis such as Comtesse de Bouchard, Ernest Markham, Ville de Lyon… and plenty of others. 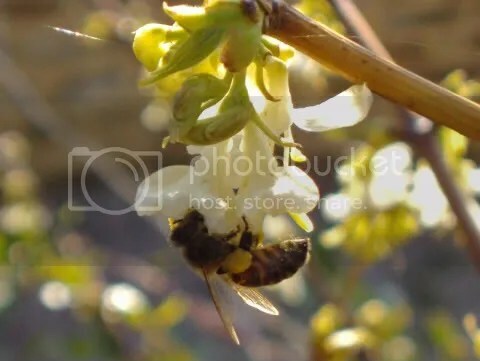 To further emphasise how useful winter-flowering honeysuckle is, take a look at this honey bee with it’s “bags” of pollen. There was an interesting article on sciencedaily.com last year which commented that Britain’s love of winter-flowering garden plants is crucial in the survival of winter-flying bees, particularly Bombus terrestris, numbers of which have been increasing over the past 20 years. A study carried out by a fellow called Ralph Stelzer has established that these bees may collect more nectar at this time of the year than in the summer which is contrary to what most people (who’re interested in the subject!) have believed.